The sunflower is one of my favorite flowers, and its plentiful seeds are packed with health benefits that can help you from head to toe. They’re easily available all year round, and just a scant handful of them can mean dramatic improvement in the way you feel. They control cell damage, thus playing a role in preventing cancer. This is because sunflower seeds are a good source of selenium, which is a proven enemy of cancer. They contain bone-healthy minerals. Besides calcium, your bones need magnesium and copper to stay strong. Sunflower seeds have both these minerals. As a bonus, they also contain Vitamin E, which helps ease arthritic pain. They keep you calm. Yes! 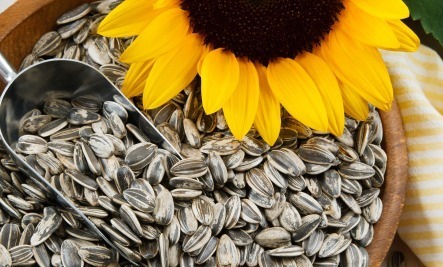 The magnesium in sunflower seeds is reputed for soothing the nerves, thus easing away stress, migraines and helping you relax. They bring a glow to your skin. The star in this role: Vitamin E again, which combats UV rays and keeps skin youthful. They ease every condition that’s inflammatory in nature, such as joint pain, gastric ulcers, skin eruptions, asthma and such. That’s because sunflower seeds are loaded with antioxidants. Just ¼ cup of sunflower seeds a day can keep heart troubles away. These small seeds disallow ‘bad’ cholesterol from sticking to the walls of your arteries, thus preventing heart attacks. With their crunchy, nutty taste, sunflower seeds can easily become a regular part of your daily diet. Sprinkle them on your salads, granola, stir-fries. Stir them into yogurt, pop them into sandwiches, rice, pasta, or knead them into your dough…the possibilities are as endless as the good qualities of these sun-loving seeds. I love sprinkling about 2 tablespoons of sunflower seeds on my daily salads. Adds some fantastic taste and crunch!